The Fabreeka PLM series pneumatic isolation mounts are low frequency vibration and shock isolators which provide both attenuation of disturbing vibration and equipment leveling. 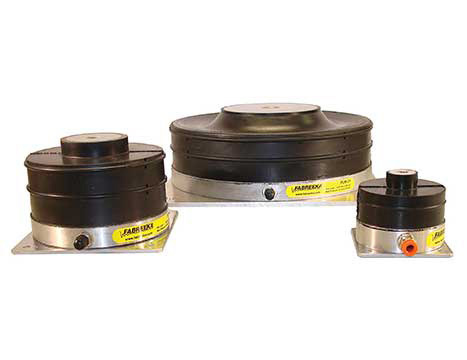 For vibration control applications, the pneumatic portion of these mounts provide significant reduction of vibration occurring at frequencies above 5.0 Hz. For shock or impact applications, the outer elastomeric wall construction provides a high deflection shock mount. A low natural frequency (3.0 Hz) can be maintained by utilizing an external spacer to prevent a “bottom out” condition. The Fabreeka PLM design includes a molded threaded insert which allows the mounts to be inflated via either the standard tank valve or a pneumatic fitting. No custom adapters are necessary. Supplied with a tank valve, the isolators are inflated and leveled manually using a hand pump or air chuck connected to an air supply. When supplied with a fitting, the mounts can be plumbed to a dedicated, regulated air supply making pressurizing and leveling easier. PLM isolation mounts will continue to isolate with no pressure having a vertical natural frequency of approximately 10.0 Hz. The vertical to horizontal natural frequency ratio is approximately 1:1 with a degree of horizontal stability. What methods are available for pressurizing and leveling the PLM isolators? A hand pump or a regulated, compressed air supply can be used for pressurizing and leveling the PLM isolators. See maximum pressure on mount. 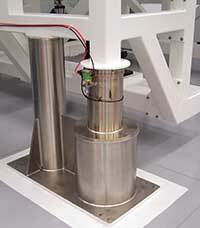 Can PLM isolators be supplied w/leveling valves for automatic self leveling? Yes. The tank valve is replaced with a push fitting, and a custom base plate is required to attach the valve. How often do I need to re-pressurize the PLM mounts? You should not have to re-pressurize these mounts often. However you should periodically (monthly) check the inflated height, as temperature can have an effect on the air pressure. Are metric threads available for the top plate? Yes. Please contact Fabreeka’s Engineering department at 1-800-322-7352 or info@fabreeka.com to discuss your application.